If you’ve spent any time in Portugal, you’ve undoubtedly encountered the iconic pastéis de nata. They beckon from every bakery window with their flaky crusts, custardy centers, and carefully caramelized surfaces. In the capital and throughout the country, they’re cheap, they’re delicious, and they’re absolutely ubiquitous; you might even say pastéis de nata in Lisbon are a dime a dozen. But I beg to differ. If you want to dive into the story and specifics of this sugary treat, you’ve come to the right place. Once you know their history and cultural significance, you’ll think twice about greedily gobbling them up in two bites. If you ask me, a confection as symbolic and storied as this one deserves to be savored. What are pastéis de nata? Pastéis de nata are a traditional Portuguese pastry that can best be described as a kind of egg tart. They look a bit like little nests, with a thick outer layer of flaky pastry dough and a filling of rich yellow custard. The top of the custard is caramelized, with dark brown or black spots and a slightly different texture than the filling beneath it. The term pastéis de nata is Portuguese for “cream pastries.” Pastéis is the plural form of the word for pastry, so if you hear or see pastel de nata instead, it’s just referring to one pastry instead of several. 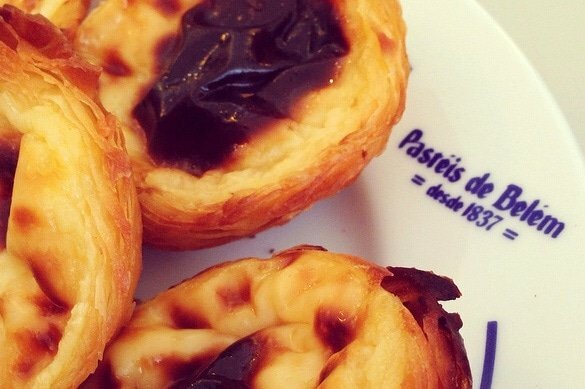 What about pastéis de Belém? Pastéis de nata are sometimes also called pastéis de Belém. But what’s the difference, and why the two names? It all comes down to time and place. 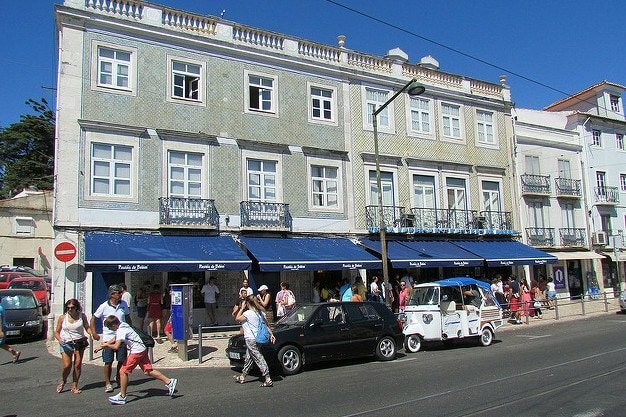 The most famous place to eat pastéis de nata in Lisbon is the district of Santa Maria de Belém, and specifically the Fábrica de Pastéis de Belém. Some might argue that the pastries you get at the Fábrica are in a class of their own, and therefore the two names refer to different things. 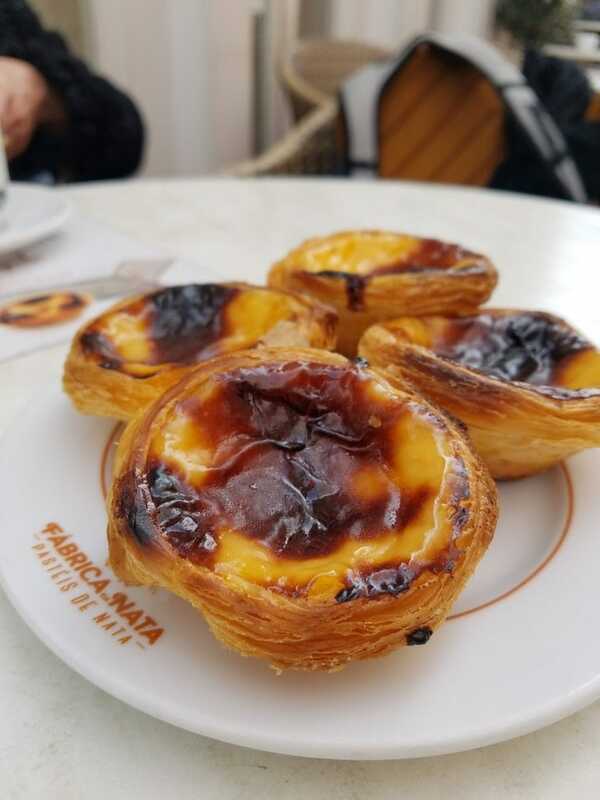 But the simplest explanation is that pastéis de nata is the generic term, whereas pastéis de Belém has been popularized due to the prestige of this particular pastry shop. Although the latter technically refers to the ones made here, it’s often used as a synonym for pastéis de nata in general. 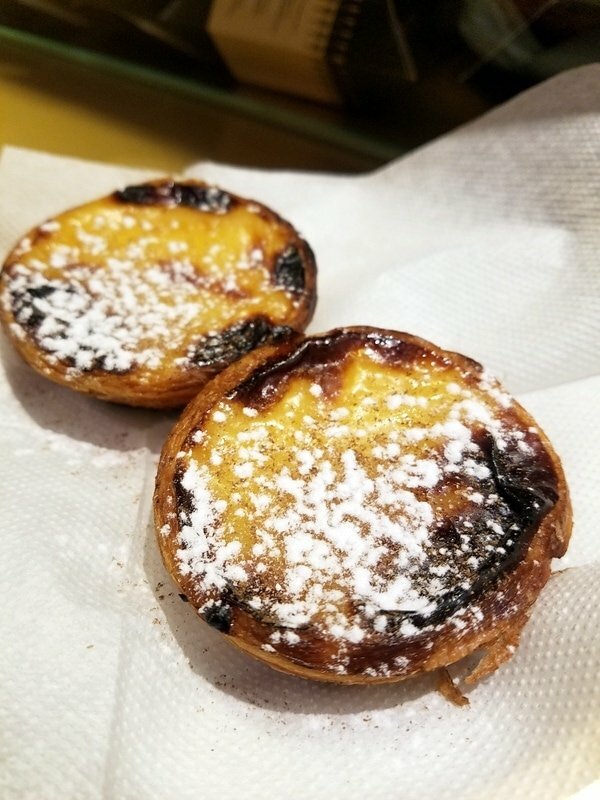 Where do pastéis de nata come from? There’s another reason why pastéis de nata are sometimes called pastéis de Belém: they were invented—or at least perfected—in this area of Lisbon. 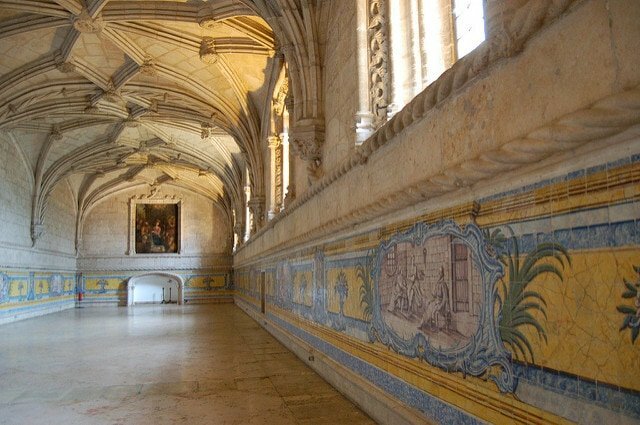 As the story goes, the monks at the Jerónimos Monastery in Belém were the first to make and distribute the iconic egg tarts. The monks used egg whites to starch clothing and fabrics, and were left with an excess of leftover yolks. Instead of wasting them, they often used them to make cakes and pastries. After the Liberal Revolution of 1820, the monks were faced with a problem. Religious institutions throughout Portugal were being shut down and no longer had funding. To bring in some extra cash, they started selling pastéis de Belém to the public. Eventually, the monastery closed anyway, at which point the monks sold the recipe to the local sugar refinery. Sensing the gold mine they had on their hands, the refinery’s owners opened the Fábrica de Pastéis de Belém in 1837… and the rest is history. How are pastéis de nata made? Pastéis de nata are certainly a simple pleasure: buttery pastry, creamy custard, and not much else. However, it takes much more effort and expertise than one might expect to achieve the ideal pastel. First of all, there’s the dough that forms the pastry crust. If you’ve ever tried to make your own pastries, you know how delicate this process can be. After mixing the ingredients, you have to work the dough into the right consistency, adding butter as you go to create the perfect texture. This takes a while, and there are no shortcuts if you want to end up with the real thing. Amateur chefs might be tempted to use store-bought pastry dough, but the result—while still delicious—won’t be nearly as impressive or authentic. After perfecting the dough, it’s time to make the filling. This involves mixing together a few essential ingredients: flour, milk, sugar, cinnamon, vanilla, and—of course—egg yolks. 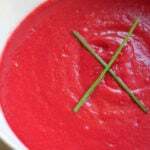 But don’t think you can just throw it all in a mixing bowl, whisk it up, and call it a day. Creating custard that’s both creamy and light is a delicate process, involving careful heating and timing. Once that’s done, the tarts are assembled and baked. This is where the magic happens: the filling thickens, the crust gets crispy, and those distinctive golden brown spots appear on the top of the custard. Once out of the oven, they’re dusted with cinnamon and powdered sugar. 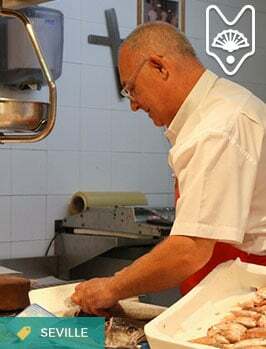 And just like that, the star of Lisbon’s bakeries is born. 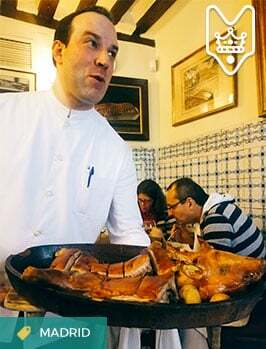 Just about every restaurant, café, and bakery in Lisbon—and the rest of Portugal, for that matter—serves this local delicacy. But not all pastéis de nata are created equal. All of those complicated steps I just listed make room for plenty of variation. As a result, the question of who has the best pastéis de nata in Lisbon is a complicated one. There are the obvious frontrunners, including the aforementioned Fábrica de Pastéis de Belém. They have their own secret recipe (passed down from the monks who created it), and hoards of tourists line up every day to try the famous specialty. I can tell you from personal experience that the pastéis here definitely have their own unique texture, with a thinner and crispier crust. But they’re not necessarily better or worse than the ones I’ve had elsewhere; it’s a matter of personal preference. The famous pastéis de nata from Manteigaria in all their sugary glory. As you can see, I was pretty excited to taste the famous pastéis de nata from the Fábrica in Belém. Beyond Belém, there are plenty of pastelarias that are well worth a visit. Manteigaria is a classic, and it was here that I had my favorite pastel de nata in Lisbon. 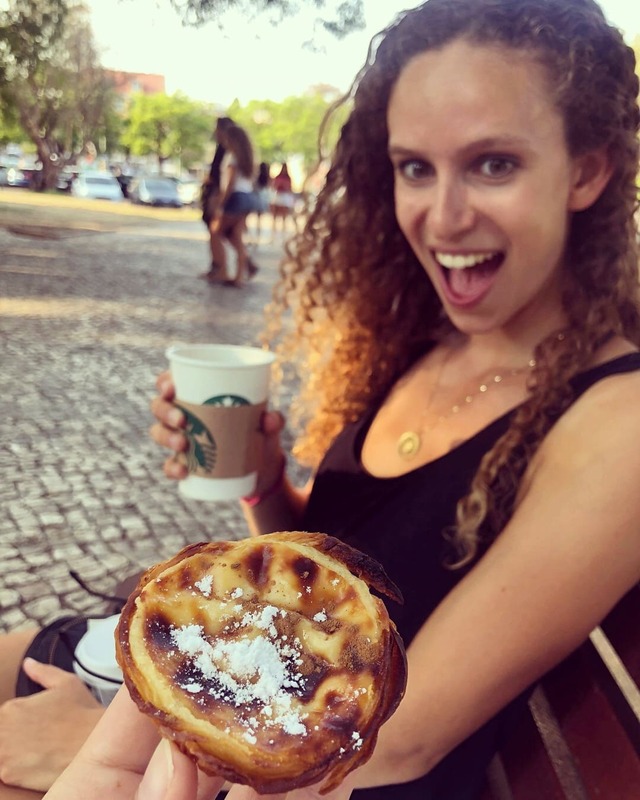 The aptly named Nata cafés can be found all over Portugal, offering a franchise-friendly version that’s nevertheless incredibly tasty. 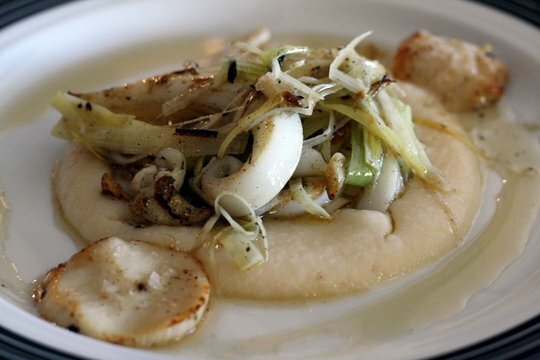 In short, you’ll have no trouble finding this treat on the streets of Portugal’s capital. It’s easy to get caught up in a search for the very best pastéis de nata in Lisbon; and if you’re up for it, I fully support that mission. 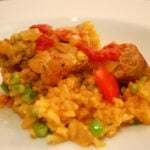 But luckily for you—and the rest of us—these delicacies hardly ever disappoint. The truth is that no matter where you buy them, they’ll probably be delicious, despite their differences. In my opinion, what matters most is that you enjoy them warm, and freshly baked if possible! With that in mind, I suggest that you sample them at every opportunity, regardless of the relative prestige of each pastry shop. 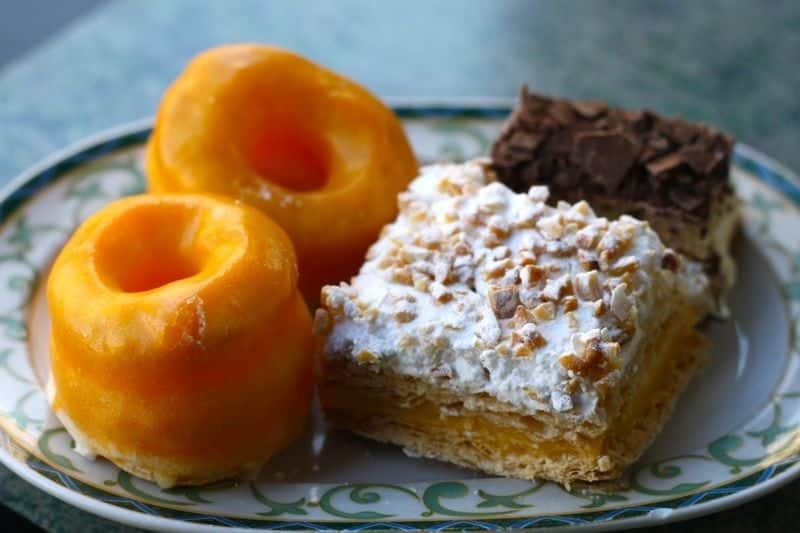 For breakfast, after lunch, as an afternoon snack… it’s always a good time for a pastel. 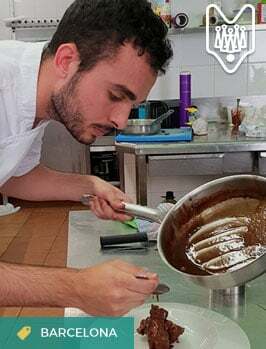 And now that you know the history of pastéis de nata in Lisbon, plus their composition and preparation, each bite will taste that much better. Have you tried pastéis de nata in Lisbon? What’s your favorite spot to enjoy this iconic pastry? Let us know in the comments! See more posts about Portugal here! I eat them every chance I get. They are often served cold at most cafes but are much better hot out of the oven. Pastelaria Aloma has the best pasteis to my taste. This is the great information, I always like portuguese-pastries, Excellent explanation.